We have indicated the number of spots available and will adjust this number as people register. To reserve your spot, call Kathy at 613-258-0177 and arrange for payment. You will leave with 3 dryer balls and a felted soap. You will leave with a frameable piece of felted art. In this class, we will be wet-felting dryer balls. Re-usable which is a eco-friendly alternative to disposable dryer sheets. You can scent them with your favourite essential oil if you like. 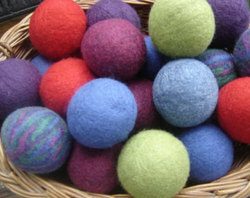 No experience is necessary for our felted soap workshop. In this class we will use an un-scented goat's milk soap that we will felt with hypo-allergenic alpaca fibre. A handcrafted therapeutic soap bar will last much longer if it is felted it is great for mild skin exfoliation. In this course, you will be given a step by step instructions on how to use alpaca and various other fibres to create a unique pair of felted mittens. 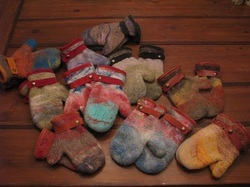 This is a beginner course in nuno felting. You will learn how to combine alpaca &/or wool with fine silk to make a unique scarf reflecting your colour preferences and design. Starting with white or black silk, participants will be able to choose colours from a variety of fibres to incorporate into their scarf design. Each participant will walk away with a finished scarf. .Here is a brief overview of the course. 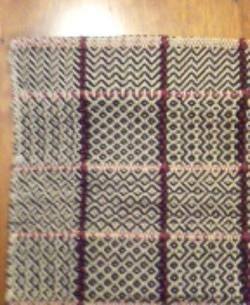 At the end of three lessons you will have warped a table loom and woven a sample for future reference. Topics covered include: reading a draft, calculating the amount of yarn you require for a project, winding the warp, dressing the loom, using a shuttle and bobbin winder, keeping track of your project. You will have the skills required to set up a loom, plan a project and weave it. All materials and tools required are provided to you. There will be "homework" to complete during the week. Reference material (books, dvds) will be available for you to review during the week. You will learn to decorate an egg with traditional Ukrainian folk designs using wax-resist (batik) method. The word pysanka comes from the verb pysaty, "to write", as the designs are not painted on, but written with beeswax. You will have enough time to complete two Easter eggs. ​ Please note that you will be given options for different patterns and designs. We invite you to join us for our annual cooking and dining class with Roshan Aubin from Aubin Farm on Thursday, April 20th. Roshan will share her love of cooking as we prepare an East Indian meal which we will later enjoy as a sit-down meal. This is a great afternoon of learning and socializing. The menu includes: pakoras with sauce, beef curry, vegetable curry, khichdi (rice and beans) and gulab jam.